(Phys.org)—Piece by piece, the circuit diagram for electron transport in the mitochondria has come closer to completion. Each new structure obtained for any of the five respiratory complexes further constrains the assembled puzzle. Eventually, big blocks are arranged into their final placements. The exact composition of the biggest block, the so-called megacomplex, has long eluded researchers. Now, after imaging 140 individual subunits down to 3.9 anstrom resolution, the Full Monty has been laid bare. Researchers describe in Cell exactly how the human respiratory megacomplex is put together and appears to function. Gone are the simple days. No more crude diagrams with complexes lined up in the membrane in a row from one to five with electrons and their mobile carriers sequentially traveling through from left to right. Bring on the stoichiometry, and bring on the 2-D. Stoichiometry means that in reality, each complex is actually represented in the megacomplex at a specific copy number. These extra copies need to go somewhere in any accurate representation. Not only that, but the smaller electron carriers need a space to hang out. They also need to be present within channels that either remain local to the megacomplex or possibly diffuse away to others. The final geometry will dictate where separate electron paths merge or bifurcate, and where they are most likely to run in reverse. The picture of the megacomplex (MC) that has emerged has the following stoichiometry: MCI2II2III2IV2. This means that complexes I,II,III,& IV are each present in duplicate while complex V is absent. It is configured within the membrane into a circular structure with the dimeric CIII located at the center and fed by peripheral CI and CIV complexes. The CII complexes are apparently not essential requirements to the core structure but rather are theorized to be wedged into gaps as needed. The authors also found evidence for a lightweight rendition of the megacomplex that can sometimes be assembled with just a single CI complex. The central positioning of the CIV dimer suggests a certain logic. CIV, or cytochrome oxidase, is the terminal resting ground for electrons entering the chain. Those that make it this far have been lowered down the reduction potential hierarchy as far as they can go. Here, they are sunk into waiting oxygen molecules, which are then exhausted as molecules of water. High potential electrons packaged as NADH enter the complex at its perimeter and are funneled into the center. The absence of C5 complexes may not be so unusual, considering that they are typically found as rows of "V'-shaped dimers that contort the membrane into regions of high curvature at bends in the cristea. With the basic structure in hand, the researchers were able to suggest a few basic principles of operation. Their inclusion and placement of CII effectively explains reverse electron transport from succinate to NADH. The proposed geometry also creates a sealed Q-pool (a lipid-soluble electron carrier) which is accessible to both CI and CII. The authors were also able to pinpoint the identity and locations of several lipid molecules that secure the complex within the membrane, specifically, several pivotal molecules of phosphatidylethanolamine, phosphatidylcholine, and cardiolipin. They were also able to identify preferred or most efficient electron transfer pathways, which in turn constrain how many electrons can simultaneously be transferred among active carriers. Among the immediate benefits of this new work is that many of the previously incompletely understood pathogenic mutations in respiratory proteins now make sense. Prior to having any megacomplex structure, researchers had no choice but to focus on how mutations affect the structure or function of individual complexes. As it turns out, most of the recorded mutations in core subunits Ci and CIII target are in residues involved in protein-protein interaction sites between complexes. (For example, disease-associated mutations in subunits NDUFV1, NDUFS1, ND1, ND5, and ND6 in CI and subunit MT-CYB in CIII). This shows the futility trying to look only at single proteins and subunits in the absence of the bigger picture. It should be mentioned that previous efforts to define respiratory complex stoichiometry have obtained slightly different results depending on which organs and species were studied. Potato, cow, sheep, and yeast, which don't always even have a CI complex to speak of, have all been studied. It is not surprising that different circumstances may call for different stoichiometry and form. Different megacomplex structures would entail different advantages for substrate channeling, catalytic enhancement, sequestration of reactive intermediates, or structural stabilization. One study that looked specifically at heart mitochondria set the ratio for oxidative phosphorylation complexes I:II:III:IV:V as 1:1.5:3:6:3. In this case, the authors called their complex the "respirasome." 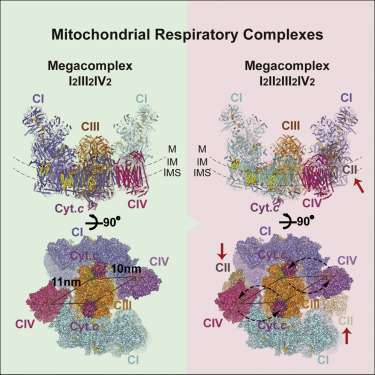 With the respiratory megacomplex now presumably cracked, the next big step forward is to pop some of the other superstructures of the mitochondrial double membrane system into models to predict why cristea look the way they do. The massive TIM-TOM import complexes span both membranes and are intimately associated with the mitoribosomes that translate mitochondrial proteins. The mitoribosomes, in turn, are localized to underlying membrane-associated nucleoids that house copies of the mtDNA. By way of analogy to the nucleolus of the nucleus, this composite nucleoid-ribosome structure has been termed the 'mitochondriolus." Other critical import complexes are in the mix of players that vie for critical membrane real estate. The malate-aspartate shuttle, for example, is the most important shuttle in the brain and equilibrates major metabolites between mitochondria and cytosol. The citrate-pyruvate shuttle for fatty acid synthesis and the glycerol phosphate shuttle (at least for brown fat and insect flight muscle) must also find homes where they can get on well with the immediate neighbors. The endemic organization of proteins into these megastructures suggest that mitochondria might resemble a hard crystal more than a fluid protoplasm. Yet somehow, they appear remarkably supple when it comes to fusion and fission. What happens to their membrane structure under these kinds of changes? Are the complexes temporarily disassembled and solubilized like the primary cilium and centriole of regular cells during mitosis? One fascinating new clue emerges from work showing that mitochondria connect to one another through 'nanotunnels' of their own construction. These nanotunnels are completely different (as far as we know) from the cytoskeleton-infused brand of 'tunnelling nanotubes' that cells themselves use to transfer whole mitochondria to one another. A recent review from Martin Picard and his colleagues in Trends in Cell Biology suggests one way that these nanotunnels might form when mitochondria are fixed to the cytoskeleton. If motor proteins like kinesin get hold of a patch of a fixed mitochondria, it could pull out a thin nanotunnel as the kinesin motors against another microtubule. The stiff body of the mitochondria and its membrane structure would presumably remain intact. This projection could then encounter another mitochondria to which it becomes attached. Picard previously showed that about half of the mitochondria within cardiac muscle have intermitochondrial junctions (IMJs) and cristae that line up into regular patterns that extend across mitochondrial networks. This uncanny network alignment is unlikely to arise from recent fission events because heart mitochondria are fixed in place and show minimal fission/fusion dynamics. The IMJs have recently been shown to control contractility by rapidly uncouplinglinked mitochondria when their own membranes are depolarized. One thing that would be of immediate interest, here, is to re-examine respiratory subunit stoichiometry in human heart mitochondria to complement the results reported here for human embryonic kidney cells.